Comprehensive, and evidence-based, Foundations of Athletic Training, 6th Edition integrates basic medical concepts and related scientific information to help athletic trainers and students develop a strong foundation in athletic training best practices. 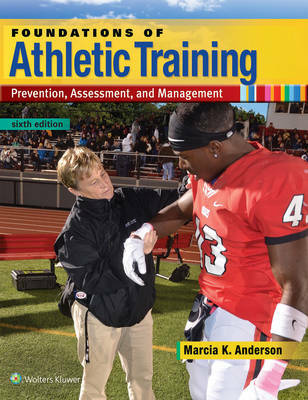 Using a problem-solving approach to the prevention, recognition, assessment, management, and disposition of sports-related injuries and diseases, the text helps students learn to think like practitioners and is fully aligned with the BOC competencies. This 6th Edition has been updated throughout to reflect current best practices in the field and includes four new chapters, new and updated references, and a powerful suite of online learning resources that save instructors time and help students succeed. Features: - Full alignment with the BOC competencies helps students master essential knowledge and skills and prepare for the certification exam and entry into the profession. - A new chapter on Evidence-Based Practice Health Care introduces students to the concepts and terminology in EBP that establish standards for best practices in the field. - A new chapter on Acute Injury Assessment and Dispositions covers emergency care strategies to prevent and prepare for emergency situations and minimize the extent of injury following current best practices as recommended by the National Athletic Trainers Association. - A new chapter on Assessment of Body Alignment Posture and Gait prepares students how to identify normal and faulty posture and interpret the findings for effective practice. - A new chapter on Athletes with Physical Disabilities introduces students to the most common physical disability groups represented in the Paralympic Games: Spinal Cord Injury (SCI), Cerebral Palsy (CP), and Amputation - Updated References refer to works published within the last five years, as well as to original ground­breaking research. - Full color images make it easier to recognize and manage sports-related injuries and medical conditions. - Anatomical line art superimposed onto human images helps students locate key muscles, nerves, and blood vessels. - Critical Information boxes highlight need-to-know information, such as signs and symptoms, practice guidelines, common injuries, and safety tips. - Critical thinking scenarios and questions encourage students to think like a trainer as they critically analyze information and apply decision-making knowledge and skills to problems presented. - Emergency situations requiring immediate medical attentionidentified with an EMS iconalert students to vital information. - Application strategies offer step-by-step instructions on how to perform skills, conduct assessments, and teach injury prevention exercises. - Field strategy boxes and management algorithms help students make better informed injury management decisions and develop practical, hands-on skills. - In-text learning aids, including learning objectives, key terms, summaries, injury scenarios and related questions, and an end-of-book, glossary, help students master key content. PrepU adaptive quizzing, a proven learning solution available as an option, provides a personalized learning experience and offers immediate, real-time feedback to help students succeed in the course and on the certification exam.